Alexander Fleming’s discovery of penicillin revolutionized medicine. It gave doctors a powerful tool for fighting bacterial infections and saving countless lives. Unfortunately, over the past century, antibiotics have become less and less effective as antibiotic resistant strains of bacteria have arisen. Bacteria are single celled organisms. They are among the oldest living organisms on the planet. Bacteria come in a wide range of sizes and shapes. They are typically between 0.5 and 5.0 µm in diameter – cells in mammals are typically 10x larger. Antibiotics work by disrupting the functioning of bacteria. It is preferred that antibiotics target features of bacteria that human cells do not have – otherwise, they would disrupt the functioning of human cells as well. The largest difference exploited by early antibiotics was the cell wall. The cell wall in bacteria is built differently from the cell wall in mammalian cells. Early antibiotics, like penicillin, inhibited cell wall production in bacteria causing it to fall apart and die. Other antibiotics target other differences between bacteria and mammalian cells. For example, tetracycline disrupts the protein building mechanism in cells. It affects all cells, but mammalian cells are less sensitive to its effect than bacteria. Bacterial resistance to antibiotics is one of the best examples of Natural Selection (often called Evolution) in action. Like any organism, bacteria are not 100% uniform. There are small differences between each bacterium. In a population of humans, there are differences in height, weight, hair colour, etc. The same with a population of penguins. Most differences are insignificant. It is the same with bacteria. Bacteria have very similar structures and metabolic processes, but there are small differences among them. Most bacteria will be very susceptible to the antibiotic, but some may be less susceptible (or, more resistant). When an antibiotic is administered, the susceptible bacteria will be affected most, and the less susceptible to a lesser extent. If the antibiotic treatment does not manage to destroy all the bacteria, or enough bacteria to allow the body’s immune system to finish off the rest, then the bacteria will regrow, but, this time, more bacteria will be descended from those that were less susceptible (more resistant) to the antibiotic. No population of bacteria is 100% uniform, some will always be more or less susceptible to the antibiotic. Repeated exposure to antibiotics without destroying the entire bacterial colony will result in a colony of bacteria that are very resistant to the antibiotic. None of these “superbugs” appeared by magic. They were always a small part of the bacterial population1, but, when their more susceptible competitors were killed off by antibiotics, these “superbugs” were able to become the dominant version. Consider a population of bacteria in which 90% are “very susceptible” and 10% are “resistant”. Assume “very susceptible” means 70% are destroyed with each dose and “resistant” means 30% are destroyed with each dose. 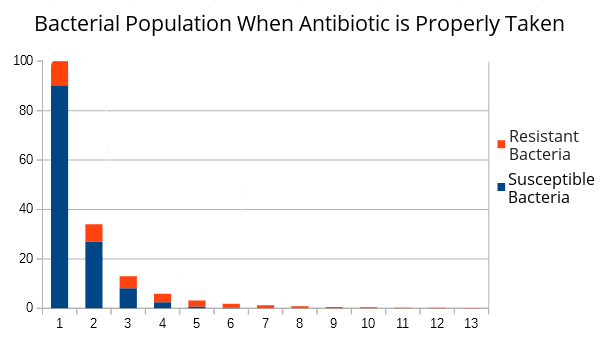 If we miss a dose, the number of bacteria double. In this case, every second dose is missed, allowing the bacterial population to recover somewhat. After a time, the resistant bacteria become the dominant ones. Even in that population of resistant bacteria, there will be some that are more resistant and other less resistant. 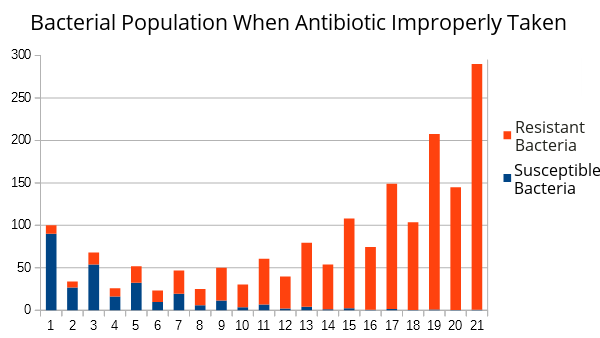 Repeatedly using antibiotics incorrectly keeps selecting the increasingly resistant bacteria, until there is a population of bacteria that are extremely resistant and antibiotics have little or no effect. 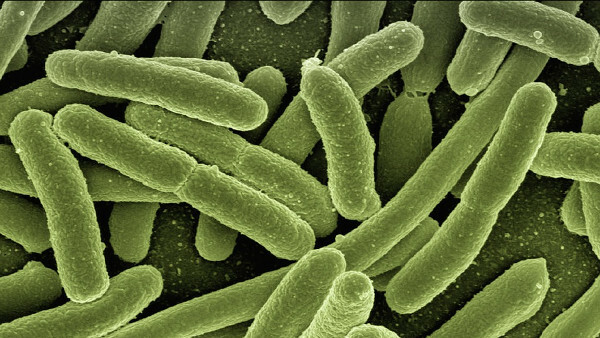 Bacteria are typically between 0.5 and 5.0 µm in diameter. Antibiotic resistance in bacteria is a prime example of Natural Selection. Incorrect use of antibiotics leads to the development of "superbugs"